Described as one of the best live bands in the world, it is fitting that Asian Dub Foundation will headline the 40th birthday of the Vale Earth Fair, which takes place at the Vale Castle on Sunday 28th August. Fusing together music from the east and west, with strong community roots, they are the ideal act for the Channel Islands longest running music festival. 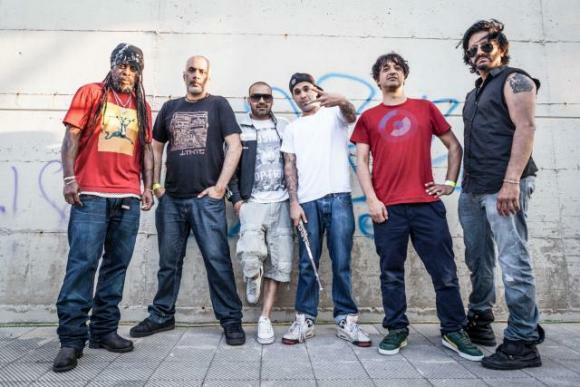 During their long and productive career of over 20 years Asian Dub Foundation have shared the stage with the likes of Rage Against The Machine, The Cure, Primal Scream and Radiohead, They have also recorded with Chick D (Public Enemy), Sinead O’Connor, who featured on their 2003 single “1000 Mirrors”, and Iggy Pop providing the vocals for their version of The Stooges classic “No Fun” on their 2008 album “Punkara”. They released their new and most anticipated album ever titled “ MORE SIGNAL MORE NOISE” last year, and the current line-up is producing some of their most acclaimed live performances ever. Their unique sound is a combination of hard jungle rhythms, dub bass lines, industrial, energetic punk rock guitars, sitar and haunting sounds sampled from traditional Indian music, supported by militant, fast and burning rap-ragga lyrics. Over the years, this ever-evolving band have continued to expand their agenda, delivering live soundtracks to film and tackling operas, while taking their fiery mix of music and social activism to far-flung places where conventional western rock bands rarely tour: Morocco, India, Cuba, the favelas of Brazil, and now to Guernsey. Forming in London in the early 1990’s they quickly started earning a reputation as formidable live performers. The band won widespread acclaim for the 1995 single "Rebel Warrior” and their second album Rafi's Revenge was nominated for a Mercury Prize. Tours to the United States (with the Beastie Boys), and Japan followed to wide acclaim, and their following album, Community Music, developed their sound further and received a coveted 10/10 review in NME. 2000 also saw ADF play a choice slot on Glastonbury's Pyramid stage to a rapturous reception. In 2001 they took on the challenge to create a live rescore of Mathieu Kassovitz's classic French film "La Haine" at the Barbican's "Only Connect" festival in London. The gig was a sell out and received much critical praise, leading to an invitation from David Bowie to present it at his South Bank Meltdown festival in 2002, and in 2003 they released Enemy of the Enemy which became their best-selling album and contained the track "Fortress Europe", a stinging attack on European immigration policy. The recent re-staging of their live soundtrack to ‘La Haine’ at London’s notorious Broadwater Farm Housing Estate acted as a catalyst to forming the current line up, where founding guitarist Steve Savale has been rejoined by original members Dr Das (Bass) and Rocky Singh (drums). Former vocalist Ghetto Priest also returned alongside ADFs newer members, Aktarvata and Nathan ‘Flutebox’ Lee, the band has become complete, and it seemed only natural that they took the next step and started to write new material, working with the legendary producer Adrian Sherwood. The new album delivers a sonic revolution, back to the real dub and militant sound of the band with a new approach, with everything composed to give a new and more powerful perspective on the already massive live performances of ADF that makes every show one of a kind. The new ADF has already headlined big festivals like Exit festival (Serbia), Rock For People (Czech Republic), Couleur Cafè (Belgium) and their new live set promises to set fire on stages all over the world. “Having tried to book them before, we’re really excited to finally get ADF for our 40th Anniversary”, said Vale Earth Fair Collective member Rob Roussel, “we can look forward a truly unforgettable day at the Vale Castle in August”. Other acts have already been confirmed for this year’s Vale Earth Fair and will be announced in coming weeks. In the meantime the Vale Earth Fair is holding a Record and CD Fair at the Wayfarer Centre on Sunday from 10am to 4pm to raise funds for the Vale Earth Fair, and is also planning an exhibition covering the 40 year history of the Vale Earth Fair in the Inner Street of the Market early in June. Early bird tickets at £15 (£10 under 18s/OAPs) are on sale though the Vale Earth Fair website www.valeearthfair.org until the end of May, afterwards advance tickets will be £20/£15, or you can pay £25/£20 at the gate on the day. Children (12 and under) are free if accompanied by an adult. Profits from the Vale Earth Fair are split between the humanitarian organisations the Burma Campaign UK, Free Tibet, and Bridge2.